Adventure through Outback Eastern Australia | So much to see! When Trekking Downunder left on their big lap it was very clear that they wanted to explore our Outback, areas that many miss on their lap as they chase the sun around the coast. They went inland and had an adventure of a lifetime! 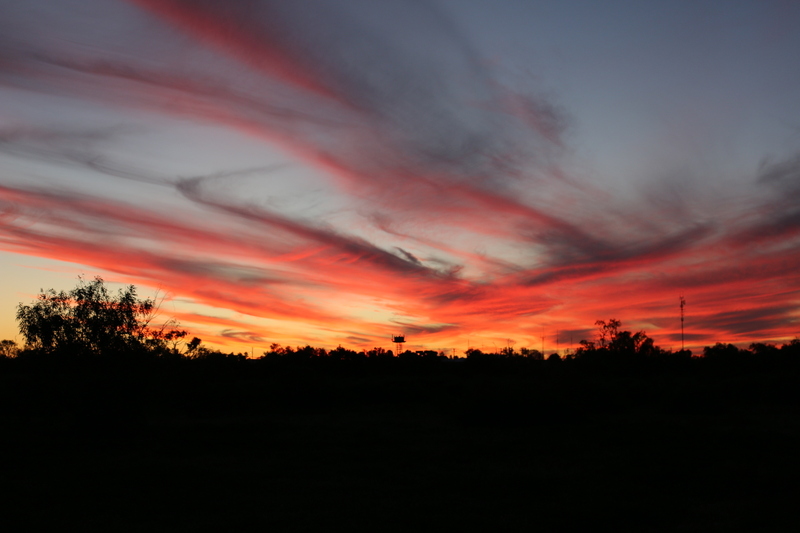 Have you ever explored the outback of Eastern Australia? So far a good portion of our Aussie Big Lap has been just that. 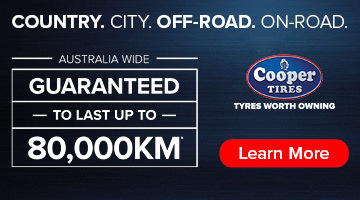 Starting in NSW, we followed the Darling River Run from Bourke all the way down to Wentworth and the Murray River junction. We then ventured up and into the fabulous town of Broken Hill before we took our time exploring our way up to and through outback QLD. The incredible three month journey we visited remote places like Tibooburra, Cameron Corner and Outback SA, to explore the incredible Burke & Wills history that surrounds the little remote town of Innamincka. After taking the tougher route to Birdsville, via the PAR Walkers Crossing we hit up the Birdsville Track from Innamincka and crossed back over the QLD boarder, where we enjoyed 6 long weeks doing a fabulous loop from Birdsville through Outback central QLD and back again for the Birdsville Big Red Bash…. Here is a just few of the great adventures we had and the priceless memories we made. 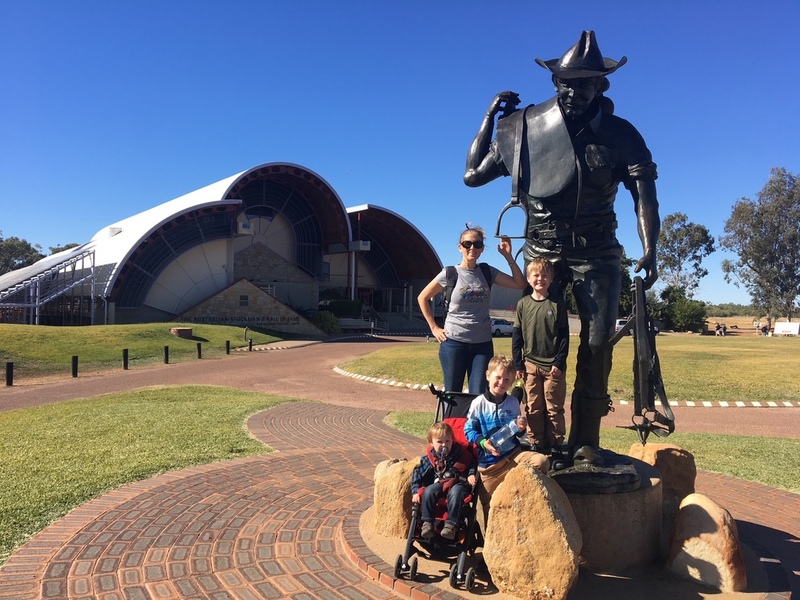 When you hit the remote outback with your 3 kids and hubby, you don’t realise that you can sometimes go 5days at a time without seeing a single car or person. Somehow the meaning of spending time with you family just got more serious….. So to break up the feeling of living out of each other’s pockets we occupied ourselves with loads of adventures. 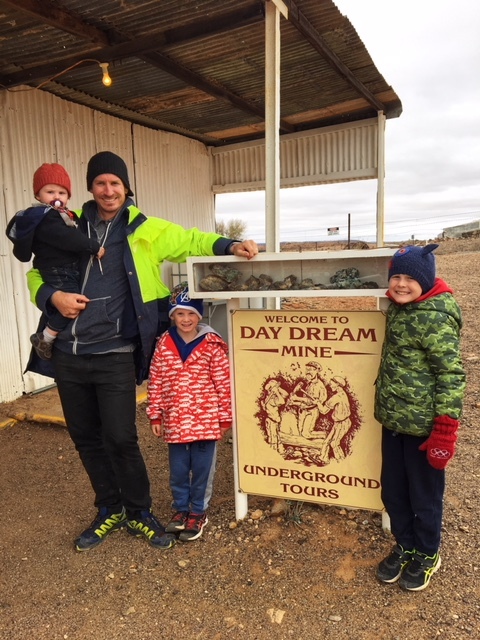 On our day trip to Silverton just prior to departing Broken Hill we took the boys to explore the underground Historical Daydream (silver) Mine, where they donned their miners hats and got a first hand experience of what is was like for the minors (and box boys) back in the late 1800’s. We then let Dad escape for a quiet moment alone to explore the Mad Max II museum in peace, this was a movie close to Ryan’s heart growing up- he had aways wanted to visit here. 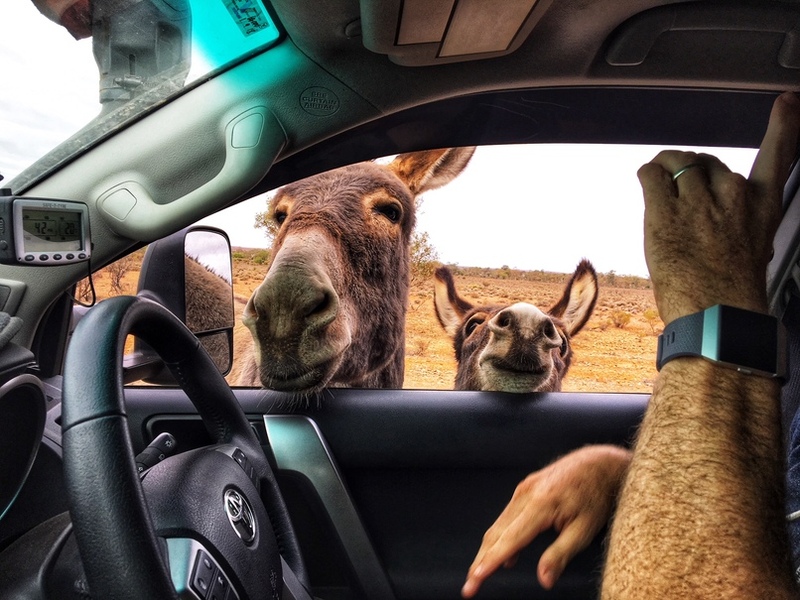 On our way out to the breathtaking Mundy Mundy Lookout we came across the locals and they stopped for a quick car window chat and a carrot, quite a highlight for the kids. We then made out way well into the Outback and explored the gorgeous town of Tibooburra, rich in aboriginal history and beauty in its landscape. 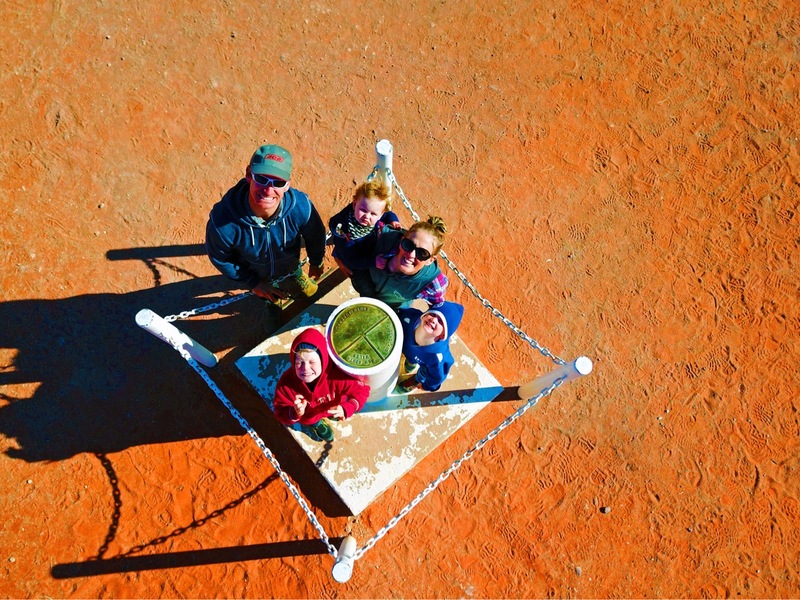 The most magical spot we have visited to date was the Cameron Corner post, which signifies the point at which NSW, SA and QLD meet. There is this aura around the site that just makes you feel a little buzz of electricity in your soul and the idea to send the kids off to different states for a nice 2 minute kid-free moment. 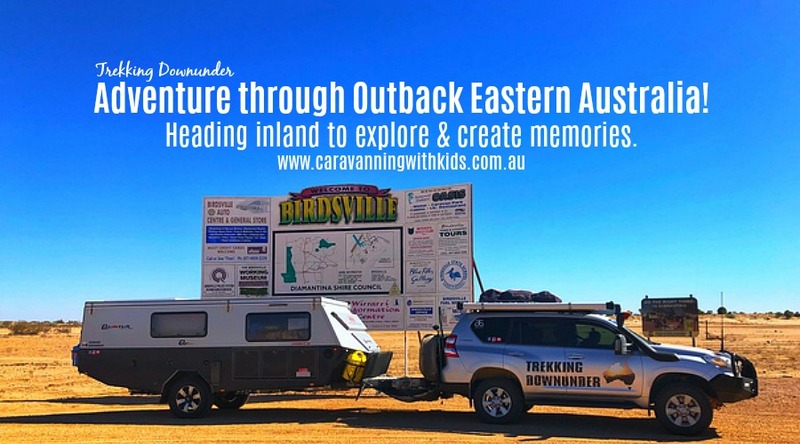 Travelling through the SA Outback we saw our first wild dingo for the trip so far and were very intrigued by the adventures of the first coast to coast explorers of 1860- Burke & Wills during our visit to Innamincka and the QLD Dig Tree Site. What an interesting expedition, with such a tragic but somewhat foreseeable end. 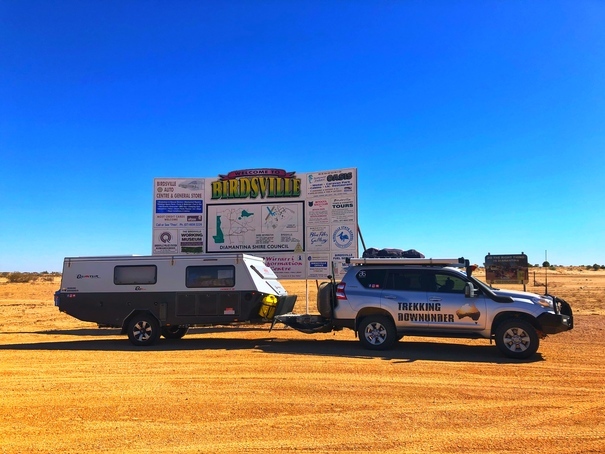 After crossing the boarder into QLD we explored Birdsville a few days before heading to across the Warrego Way and heading for one of our new favourite towns Charleville. 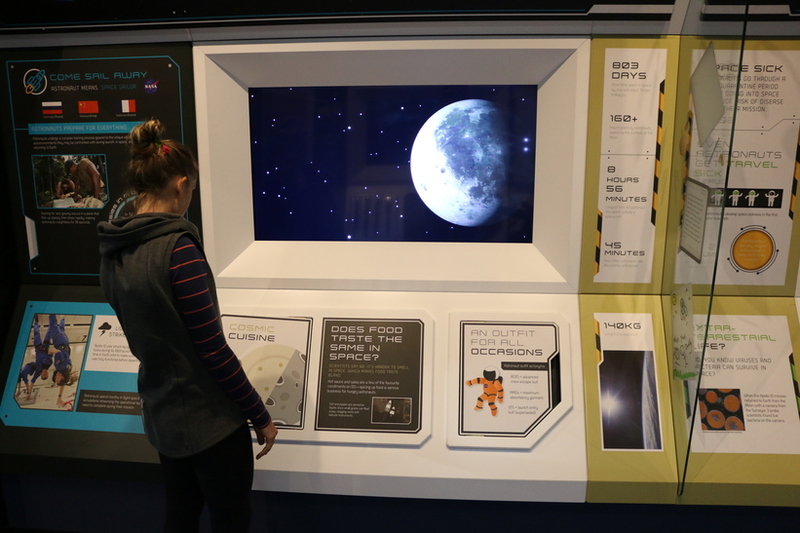 Now here is a haven for Kids to maximise their minds and sensors! Between the Bilby Experience and getting to pat and learn all about these endangered species, to the Top Secret WWII tour and its full of history and American mystery, to the utterly incredible Charleville Cosmos Centre and Observatory’s sun viewing, guided night sky exploration and the Astronomy By Day space museum- it was safe to say our kids (and us for that matter) were utterly star struck by this incredible community. From here we found the best coffee I’ve ever tasted in Australia in the little town called Morven only an hour down the road from Charleville. The insatiable coffee was located at ‘Kill For A Cuppa’ coffee and tea house at the Gidgee’s Bush Camp. 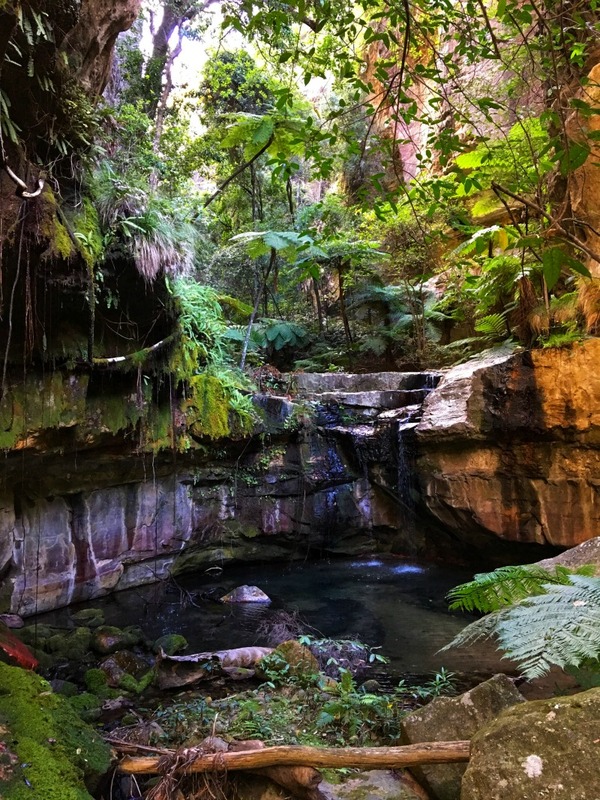 The most beautiful place to date that we have explored was the National Park of Carnarvon Gorge….. Wow- full of beauty and mystery and oozing with the most intriguing Aboriginal history which we learnt first hand about from Milton, a local aboriginal park ranger whilst staying at Sandstone Park. 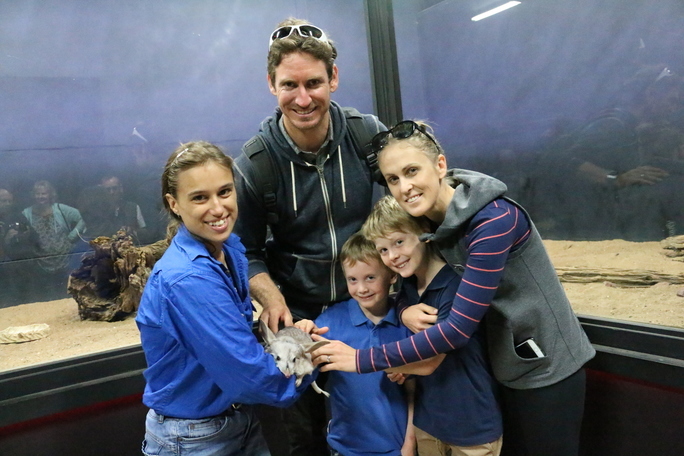 After a quick stop to the Sapphire Gemfields to giving the kids a true gem fossiking experience we left with an extra bag of wash in hand and headed for Longreach. What place to stop, I think this place was super memorable as it was the location that Ryan finally realised we were not on a holiday anymore…. He was finally able to fathom that this was our lifestyle now- it was hilarious- you could see an instant change where you could almost hear the brain cogs start to slow. 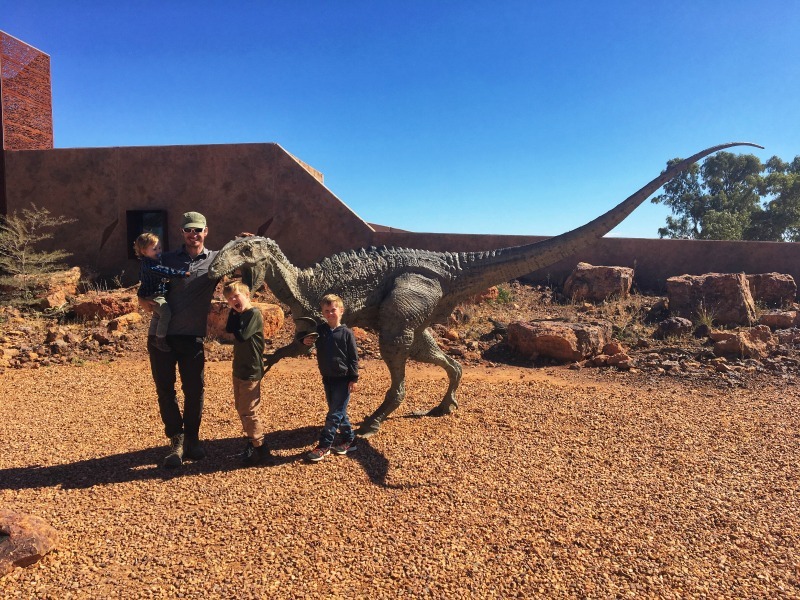 After visiting 2 of the most awesome Outback heritage rich museums here; Australian Stockman’s Hall of Fame and the Qantas Founders Museum we then Headed to Winton to start the Dinosaur Trail…. Have you ever heard of Austalia’s Dinosaur Trail? 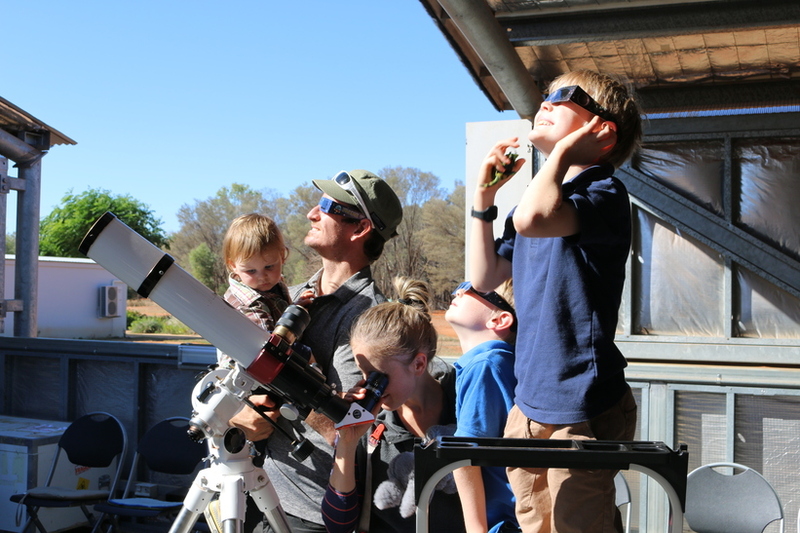 It showcases 4 of the most spectacular locations in Outback QLD known for their dinosaur fossils discovered, although 1 of the 4 is quite different and this definitely happens to be the most i found the most captivating. 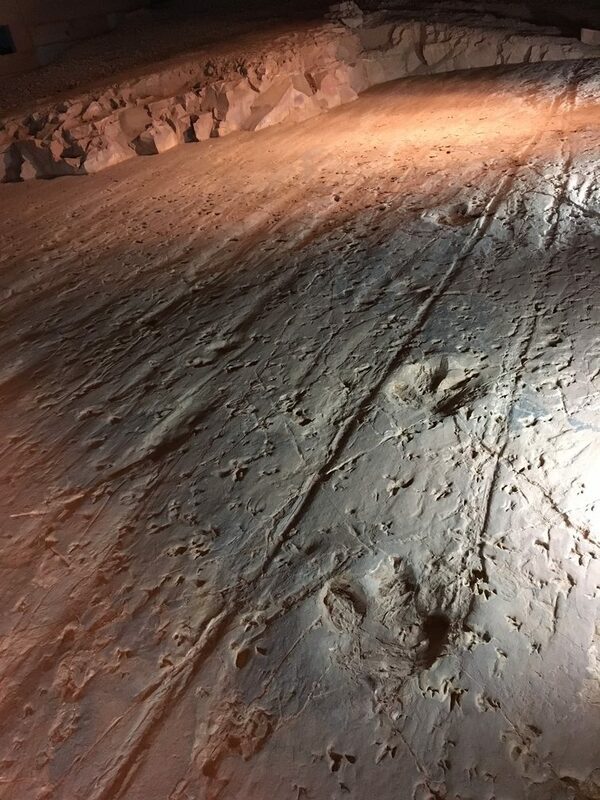 In Lark Quarry just down from Winton is the Dinosaur Stampede, the only discovered and preserved evidence of a notable stampede in the entire world. The Stampede is something hard to put into words but rather a place you have to go see, believe and feel the incredible energy of. From here we ventured through the picturesque landscapes of the Dimentina National Park and then back into Birdsville for the Big Red Bash. Did you know Australia has claim to the Most Remote Music Festival in the World? The 5day long BRB event is held at the Big Red sand dunes at the edge of the Simpson Desert bordering with Birdsville. It attracts amazing Australian Artists of all eras and this year 9,000 guests, crew and volunteers. Having the opportunity to take the kids to such a unique event at their ages was amazing! With loads of families and opportunities like the Big Red Rumble where Jake and Lucas performed in front of the entire events attendees with 198 other kids at the hips of the talented Crack Up Sisters. The event was full of truly proud moments like these and unbeatable memories. Best part was that originally we had paid to go and we picked up the opportunity right before the start to be volunteers and got a full refund on our tickets- it was so awesome to get to see such a huge event from behind the scenes as well as being concert goers- what an insanely well organised machine. From here we ventured up to Mt. 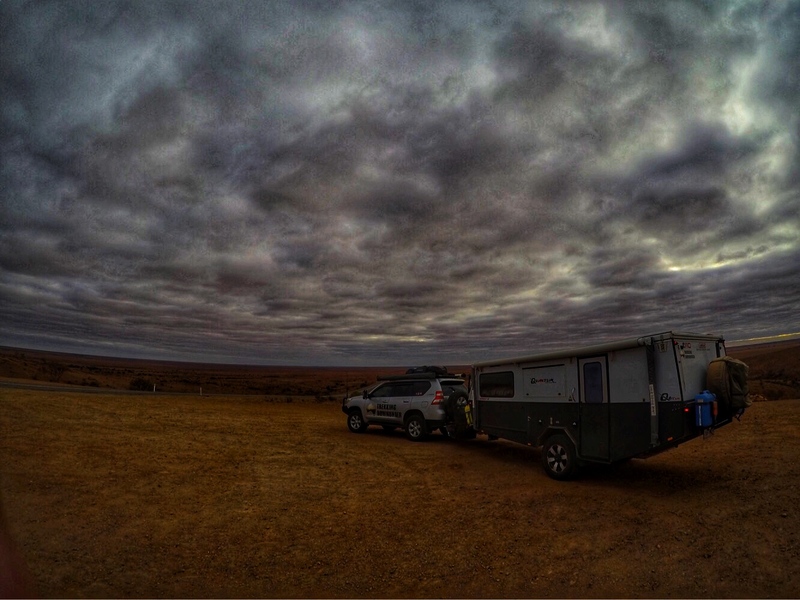 Isa up through Bedourie and Boulia and then across to the coast for the first breath of ocean fresh air…… As gorgeous as the coast was….. We truly missed the outback and just couldn’t wait to get back to the dirt and dust beyond the bitumen. Totally recommended getting off the tar and hitting up the path less travelled, you’ll just love every breath taking moment of it. 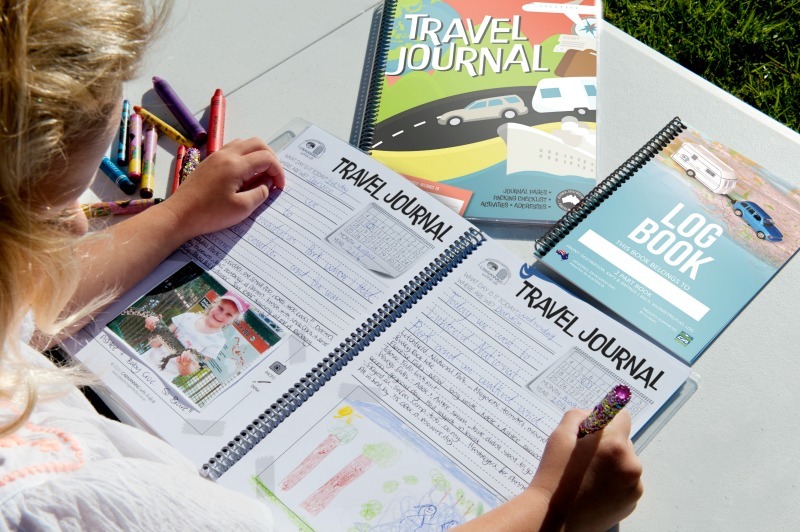 Aussie made Travel Journals & Caravan/Camper Log Books!